Limited to 500 hardbacks and 50 Leather Bound edition (£199) Less than 50 left in stock! The book is being published by the author in conjunction with FishingBookSender and I doubt there will be more than 250 copies. The first 100 have numbered and multi signed certificates, (Sorry - the Cerificated copies are all sold!) there will then be an unlimited run of un-numbered copies. This wonderful book is £29.50 including post and packing. Please read the reviews for this book, they are all genuine! 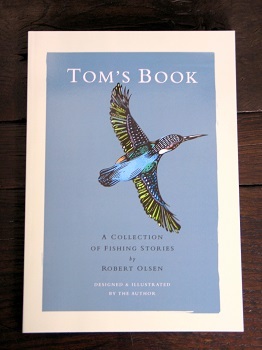 Tom’s Book is a personal project - written, illustrated and beautifully designed solely for his son. Those that saw the draft persuaded him to publish. The limited edition hardback and Leather version's (distributed by Fishing Booksender) sold out as soon as news about it was released. A paperback version is now available directly through Fishingbooksender. With a foreword by John Bailey the book consists of 184 pages with 21 chapters, each is illustrated with a full page drawing and chapter heads in pen and ink. It is a very personal view of fishing involving friends, barbel, grayling, chub and salmon from the Wye valley, carp and tench from hidden pools, trout from streams, crazy thoughts, fun and a meeting with Bernard Venables that brought his childhood fishing full circle. Robert Olsen is a freelance artist whose work was recently included in Tony Meer’s recent book, ‘Angling Artists’ and runs an online gallery www.thefineartoffishing.com where limited edition prints from the book are available. In association with John Bailey, he has also illustrated several fishing books including ‘Fishing in the Footsteps of Mr. Crabtree’ that accompanied the TV Series. Through ‘Tom’s Book’ he has brought together his love for water, the written word, typography and illustration into a single volume. Although techniques and baits have changed over the years, the same questions are at the forefront of the carp angler’s mind: Where are the fish? What’s happening under the water? What bait should I use? This time Jon Wood has taken the science out of Carp Fishing Science in order to answer these and other questions about carp location, feeding & bait. What we are left with is pure and simple carp fishing aimed at improving the angler’s grasp of these three concepts that are key to successful carp fishing. Any level of carp angler will benefit from the clear and enlightening contents of this publication which is sure to become one of the most talked about new titles. £22.99 Plus £2.95 P&P In stock for immediate delivery. Limited editions available, first come first served. Signed copies of the Hardback are now in stock, but they are going quick! - Please ask for signature when ordering. 35 leather bounds (£220), 35 special hardbacks (£85) and around 500 hardbacks (£30). All plus P&P. Limited Signed hardback copies in stock - Please ask when ordering. A few leatherbound editions and Special Hardback editions still available, We have decreased the limitation to 35 of each. This title is no longer being produced but there are a few copies left, when they are gone, they are gone, going to be a collectable of the future as very few produced. There is a little surprise inside the cover!!!!!! Signatures, signatures, signatures. One of Angling's true gent's latest works, way ahead of his time!